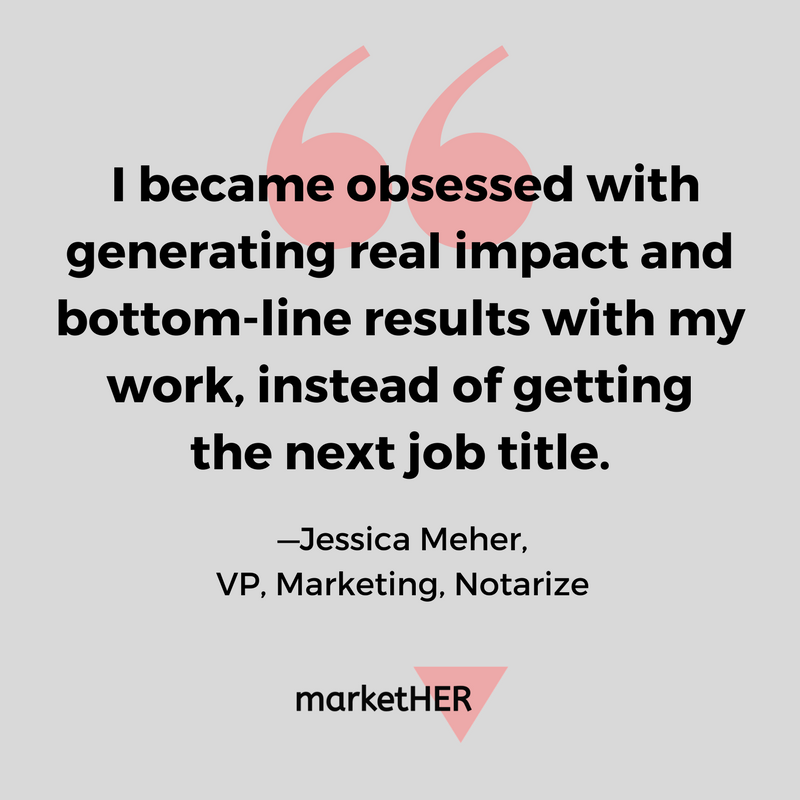 Jessica Meher is VP, Marketing at Notarize and Founder of Girl Capital, a network for aspiring female angel investors. Previously, Jessica was VP, Enterprise Marketing at InVision and has over 10 years of experience leading go-to-market strategy for high-growth tech companies. Prior to InVision, Jessica held several senior marketing roles at HubSpot, helping the company grow from $18M to >$130M in revenue, from a private company through a successful IPO. With a lot of hard work and perseverance! Honestly, I'm still learning how to lead every day. My career path wasn’t linear. There were lots of ups and downs. I spent the bulk of my early career (and still to this day) focused on learning everything possible about marketing, yet always questioned conventional wisdom. You may have heard about the concept of T-shaped marketers—I loved and adopted that framework. I moved laterally for a number of years, looking to master many roles in marketing before I became a people manager. I became obsessed with generating real impact and bottom-line results with my work, instead of getting the next job title. Once I moved into management, I had to learn how to hire and retain remarkable people (part of that learning meant making some bad hiring decisions). Hiring A+ players—people who are smarter than you—and keeping them challenged is the #1 skill to learn as a manager. It took me years to become sort of OK at it, but I don’t feel I’m anywhere near great. What helped me move into executive-level management was not only having a T-shaped marketing skill set and knowing how to hire a great team, but getting good at foresight: setting the long-term vision, identifying opportunities for company-wide growth, and implementing change across functions. To me, great leaders don’t just do what’s in their job description or wait for a promotion. Leadership is not tied to title, but to impact. I’ve had a lot of failures over my career because of my fear of failure (funny how that works, eh?). I was incredibly conflict avoidant and focused on doing everything perfectly, rather than taking risks. I suffered from a crippling lack of confidence and imposter syndrome. Those issues really held me back. It took me years to work on those challenges. To this day, they’re things I still address daily. I grew up in a lower-middle class area, where most of my family worked in blue collar jobs. I went to 3 different colleges, and it took me 7 years to finish my degree. When I started at HubSpot, half the company had graduated from MIT and were from established backgrounds or had gone to private schools. Imposter syndrome ensued. I kept a lot of ideas to myself and didn’t speak up much—I was afraid of saying something, well, stupid. I just assumed that if I disagreed with someone or something, that perhaps I wasn’t smart enough to see the full picture and it wasn’t worth surfacing. Then, one day, our management coach told me something that changed my life: He said that keeping ideas to myself was selfish. That I was doing a disservice to the company, which had hired me for my ideas. He told me that seeing things differently and challenging others were great assets, and I should celebrate them, instead of running from them. From then on, I did a complete 180°. I still have to battle imposter syndrome, but now I just remind myself that not speaking up is selfish—and I certainly don’t want to be that! I’d work on addressing my confidence issues much, much earlier. Oh man. I’d say every time I see someone I’ve hired get promoted or take on a new, bigger, and more exciting role—that really fires me up. It makes all the hard parts of management worth it, when you can affect people's’ lives and careers and see them go on to do more amazing things. What’s your advice for up-and-coming marketers? Too many marketers rush into management or senior-level titles. As a result, they may get that shiny title or a higher salary, but they end up at a poor company or a place that doesn’t challenge them. 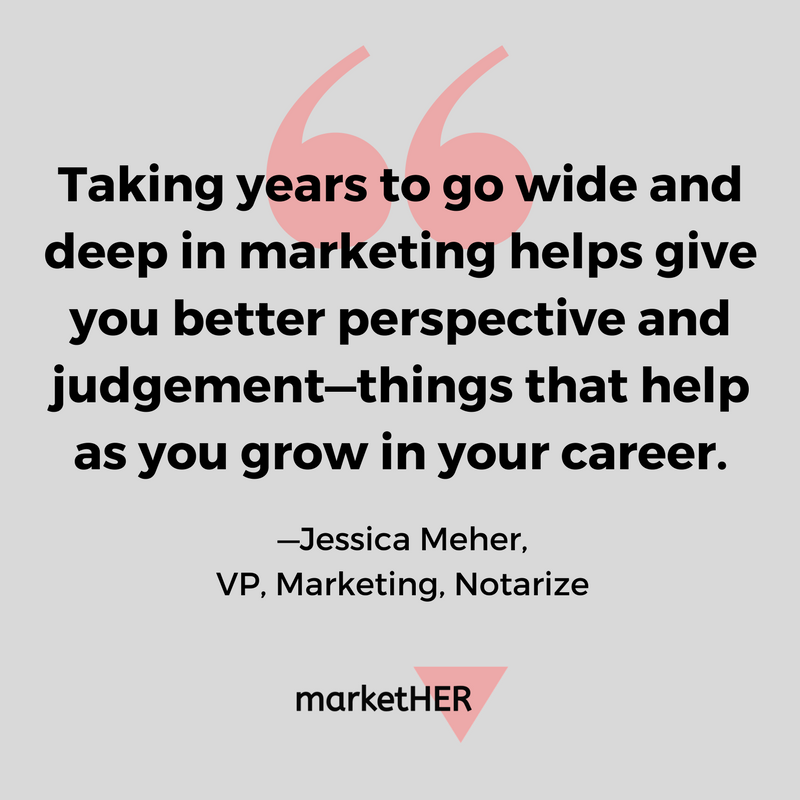 Taking years to really go wide and deep in marketing helps give you better perspective and judgement—things that help as you grow in your career. Become impatient about learning, not about your title. Share something interesting or valuable with the community. I don’t want to be one of those people who recommends a business book, but there is an underrated title that I’ve found very helpful: Succeed by Heidi Grant Halvorson. It helped me break some bad habits of perfectionism and become more comfortable with taking risks.